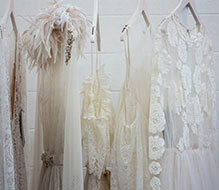 The great wedding dress hunt can be a daunting task, where to begin? Most brides start by choosing their favourite wedding dress designers. Once you've decided who your favourites are, then you can search for local boutiques who stock those particular designers. With everything from unique and unusual wedding dresses, to bridesmaid dresses and wedding shoes, these boutiques have everything you need to make you and your wedding party look fabulous! Use our handy search above to filter through wedding dress designers that you like or search by style if you prefer. Enjoy getting lost in the latest wedding dress collections and save your favourite dresses in your dashboard. Each dress links through to local stockists so you can find your nearest boutique. The average bride chooses her dress roughly 8-9 months before the wedding to ensure lots of time for any alterations that might be required. Most bridal boutiques will need to order your specific dress in or make adjustments so it fits perfectly with your size. Stockists tend to be small so if you can arrange appointments during the week this Is ideal. Some also charge a small fee for appointments particularly at weekends and many of these are refundable if you purchase one of their dresses. Be open and friendly with your stylist so they can help you find the dream dress in your style, figure and budget. Be open to their suggestions as you never know which dress you may fall in love with. Finally, we recommend trying to wear shoes that will be similar to the ones you will be wearing on the wedding day. It’s always fun to bring your mum, your mum-in-law to be (if you dare) and your bridesmaids along. Including them in this experience and getting their views will be helpful, you hope! 1)	Try and limit the number of family members / bridesmaids your bring with you. It’s fun to shop with people but too many opinions can make the decision more difficult and the whole experience can end up being more stressful rather than the enjoyable part of wedding planning that it should be. 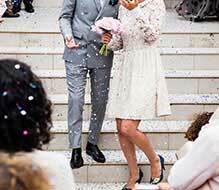 2)	Keep in mind that wedding dress shopping doesn’t just include the dress and that you’re budget may need to cover shoes, accessories and special underwear (if you’re going for it!). Getting any alterations done will also cost so worth taking some time to work out how your budget will cover all of this. 3)	Don’t lost hope! Just because you’re struggling to find “the one” there are hundreds of dress designers and thousands of dresses out there. It’s just like finding a partner, there’s at least one dress out there that’s right for everyone. 4)	Make sure you’re realistic about what suits your body. Worry less about weight and more about shame and frame. Buying a dress that you think you’ll suit in several months time but doesn’t really work for you right now isn’t always the best option. 5)	Try and do your wedding dress shopping mid-week. 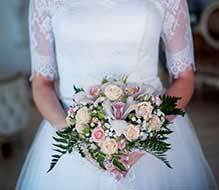 Bridalwear boutiques often get booked up quickly at the weekends and there’s nothing less enjoyable than feeling rushed when you should be enjoying the experience. 1)	Be sure to ask for advice from your bridalwear stylist. Just because you like the look of the dress on the hanger doesn’t necessarily mean that it suits your body type or even your character. Your stylist is likely to be helpful and most importantly, honest about what suits you. 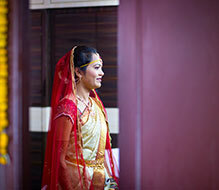 2)	Find out from the outset if alterations are included in the cost of your gown. Several of our past brides have said they got their fingers burnt here and ended up spending quite a bit more than they had budgeted for. 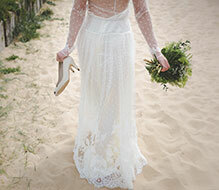 3)	Get advice on what accessories, shoes and jewellery fit best with the dress. It’s those extra little details that can make a huge difference so while you may think it’s all about the dress, remember the small things matter! 4)	Try and establish the timeline for purchasing the dress. How many fittings will you need? How far in advance of the day will you pick the dress up? 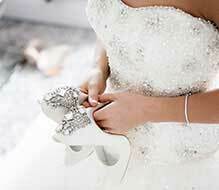 Is there enough time between your wedding day and getting the alterations done that you’re looking for? 5)	Worth establishing what the boutique’s refund policy is and their payment schedule. Does that fit with your own timeline? If you’ve found your dress 8-9 months before the wedding, you may have changed your mind about it 4 months later. 6)	Finally, what may seem like a rather strange question but we actually here this a lot. Remember to get advice as to how to put the dress on. They can be trickier than you thing and the last thing you want to do is rip it on the big day. We’ve split the above into categories and designers to try and provide you with the best online, wedding dress search experience. You can filter designers by price, material, shape and much more. Alternatively you can search through our curated selection of dresses according to season, weather or style. 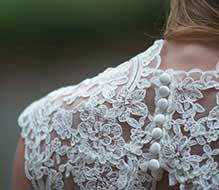 From the latest lace wedding dresses to timeless, vintage pieces, the collections we support are bound to have something for you. Once you’ve found a dress you like, click through to find your nearest stockist to arrange a fitting and to see what other dresses they have that you might like.